Dewees Island is a private island accessible only by ferry. With proper planning, staying on the island is a breeze and a unique experience unknown to many visitors of the Charleston area. Here are helpful videos on packing and transportation. and a few garbage bags. Online Grocery Orders- Order groceries and pick them up on your way to Dewees. No need to get out of the car! They will have them packaged and ready for you. Coastal Expeditions- For kayak, paddle board, and boat tours. Fresh Seafood- Boone Hall Market or Mount Pleasant Seafood offer great options for your seafood needs. Deep Sea Fishing Boat Charter- Captains Ben Floyd and Chad Ferris are two great options for a day at sea! They will even pick you up from Dewees. "Check-In" is different than most other places. You don't need to stop at an office to pick up keys. You simply board the ferry at your scheduled time. When you arrive at Dewees, you have golf carts associated with your property waiting for you and your property is unlocked. Arrive at the Dewees Island ferry landing 30 minutes before your "check-in time". If you are taking the 4:00 ferry, arrive at 3:30. Guests do not need to call the ferry for arrival, only when departing. Load your belongings onto one (1) or (2) luggage carts and park in the rear of the lot. Relax under the covered area until the ferry captain approves boarding. The floating dock should remain clear of people and belongings. The ferry departs promptly on the hour. 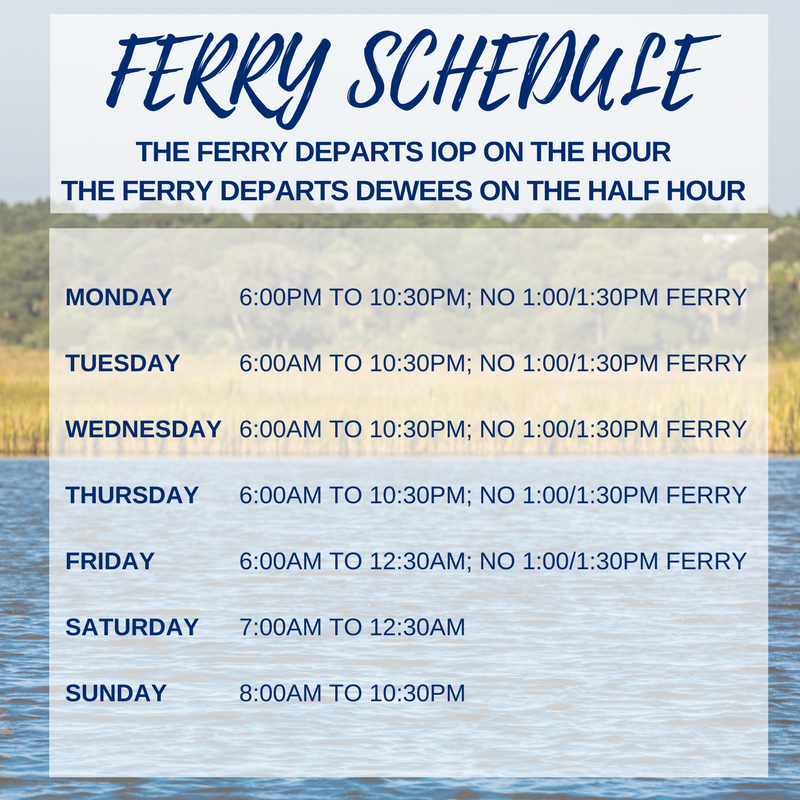 Click here for the ferry schedule. Upon arriving on the Dewees Island dock, locate your golf cart(s). Your cart(s) will be labeled by property name and lot number. Prior to arrival, print this map for locating your lot number and exploring the island. For guests arriving at night, a dependable flashlight is a necessity. 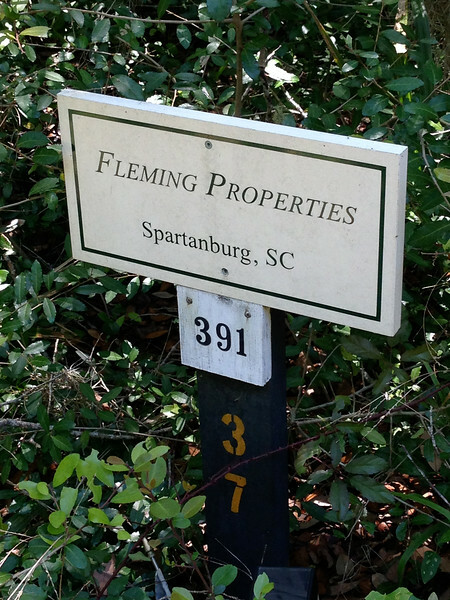 Each property is marked by a wooden post with the lot number in orange. No keys are required for accessing your property as Dewees is an ultra-exclusive and private island. Golf carts are battery operated and essential for navigating the island. Chargers are located in the garage of your property or in the rear of the cart. Verify the charger is working by listening for a hum and watching for the charge needle to move. If unsuccessful, unplug the charger from the cart and try again. The cart should be charged each night to avoid transportation obstacles. Water is EXTREMELY expensive on Dewees! We know you're on vacation, but being on an island with its own recycled water makes it unique. Only shower when needed and make it quick. Only do laundry when you have a full load. Only run the dishwasher when you have a full load. Make sure all outdoor hoses, showers, and fish cleaning sinks are OFF. If you notice a running toilet, shut that toilet off and email us at vacations@dunesproperties.com IMMEDIATELY. If the owner is billed for excessive use of water, it's possible that the bill will be passed along to the guest....and we reeeeaaaally don't want to do that. So please be mindful of water usage! You need a license, which can be purchased on SCDNR website. We do not supply fishing poles, tackle, or bait. You can pick those items up at the Isle of Palms Marina Store, which is located right next to the ferry landing. Keep in mind, we do not fish or crab with anything but native fish (mullet, shrimp, mud minnows, etc). Limit use of dock to 1 hour at a time. If there is a sign in the impoundment that says NO FISHING, you are not permitted to fish within 60 feet of that area. Use of any PUBLIC dock is permitted. Driveways that have a person's name on them are private docks. Some examples of public docks are the ferry dock, Lone Cedar, & Big Bend. Please reference the map for locations. Crabbing and cast netting is permitted during this time from the Crab Dock in the impoundment (see map), so long as you use a hand line and only fish for bait. Please remember to dispose of unwanted baitfish on the outside of the impoundment. Bait must be native fish (mullet, shrimp, mud minnows, etc), and can be purchased at the Isle of Palms Marina Store next to the ferry landing. You can also use remains of any fish you catch. Crabbing is done inside the impoundment. We do not allow any use of closed traps in the impoundment (they attract alligators). Only catch enough to eat in one sitting. No more than 2 crabs/person. Limit 20. Limit use of dock to 1 hour at a time. To schedule a visit to Isle of Palms or Charleston during your stay, call the ferry at least 45 minutes in advance at 843-568-3990. When riding the ferry you are a guest of Charleston Coast Vacations. So when you sign in, you will see a section to write owner or visitor. You are a visitor and your lot number with Dewees Rentals is "200". That's the magic number, so lock it in your memory bank! Every private house offers internet access through AT&T. As the island is remote, this service can be intermittent at times and should not be expected as an amenity. Dewees is a rustic, barrier island favored by environmentally minded, outdoor-oriented guests. All properties have a regular pest control service and are well maintained. Still, the island is a natural habitat, and all forms of wildlife including flying, buzzing, crawling, and slithering types should be expected. It is illegal in South Carolina to “spotlight” to look for wildlife after 9:00 pm. If you are looking at animals after that hour, stay in your golf cart and be considerate of homes nearby. In addition, nesting turtles will avoid our beaches, and hatchlings will be disoriented if you are waving flashlights around the beach. Keep outside lights off at night in oceanfront homes. Keep dogs leashed in the vicinity of all shorebirds. The best time and location to run your dog on the beach is at low tide near the center of the island and where birds are not congregating. Only walk dogs north of Osprey before 8:00 am. Steer clear of resting birds. Large flocks of birds will reside on the beach at high tide. Consider walking the beach during a mid or low tide, this allows birds to rest and helps protect the dunes. Avoid walking through dune areas. Wintering birds will use the areas between dunes for shelter, and later in the year, the dunes are used for courtship and nesting. These are strictly prohibited on the island. Propane grills are accessible for every property. Houses offer private grills and suites share a community grill. Public Safety refills propane as needed. They can be reached at 843 296 4952. Please separate and deliver all garbage and recycling to the on-island facility. Please reference your map for the garbage and recycling location. Recycling is a hot ticket item these days. Note that there are large "Garbage" and "Recycling" dumpsters at Public Works (use your map when on the island). Recycling must be loose and not in plastic bags or Charleston County will mix it with the trash. Make sure to recycle the items listed in our house manual LOOSE and not in bags. We appreciate the extra effort on this! 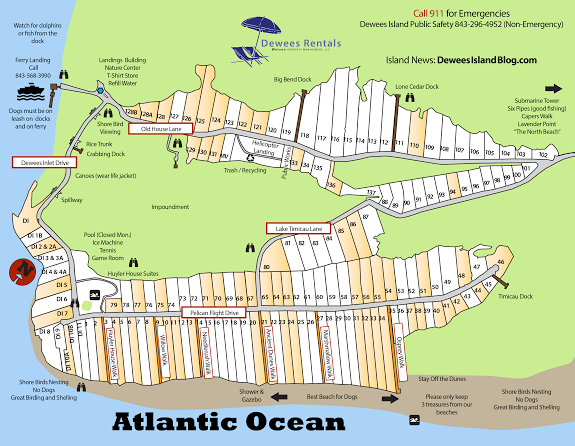 Cellular service is intermittent on the island, however, all private homes offer a phone for local calls. Bed linens and bath towels are provided for all vacation properties. Beach towels are occasionally available so please plan to bring or purchase beach towels. Beach chairs are not advertised or guaranteed with properties so please plan to bring these items. Often, guests will leave a few chairs at departure so occasionally a few are available. If needed, The Isle of Palms Marina is a great option for these items. Please rinse & neatly store equipment before leaving the island. Please limit your collection to three (3) items and avoid leaving extras at the property. Bicycles can be privately arranged and delivered, however, most guests find the included golf cart sufficient. Isle of Palms Bike Rentals 843 747 BIKE (2453). Dewees Island does not offer restaurants or stores, however, excellent options are available on the Isle of Palms and surrounding areas. For an insider's guide to area activities, restaurants, events, and local favorite, please visit our Things to Do page. We recommend taking extra luggage to your vehicles the night before. It will greatly expedite & simplify the departure process. Place all used linens in the laundry room. Please leave bedspreads, pillow covers, and mattress pads in place. Many guests will start a load of towels as a courtesy to the housekeeping company. Please separate and deliver all garbage and recycling to the on-island facility. Please reference your map for the garbage and recycling location. Please empty the refrigerator and return all dishes to the cabinets. Please close all windows and doors. Please leave AC at 78 and Heat at 69 upon departure. Click here for things you can do with your kids in the greater Charleston area: indoor arcades, water parks, arts and crafts activities, museums, fountains that invite play. Make sure to make time to head inland to one of the coolest cities in the United States! Downtown Charleston is full of history, art, great food, and even more! Click here for Things to Do! Being a nature island, there are many activities that are done, especially during summer! Below are listed all the different programs happening throughout the summer. Follow us on Facebook to know which activities are happening that week! Charleston, SC, and the surrounding area are rich in history and culture, and there are wonderful things to do both outside and inside to explore our rich colonial and civil war history. Click here to Discover Charleston! This is a list of things you can do to be out in nature in the greater Charleston area-- within an hour or two of the Dewees Island Ferry on the IOP side. Check them out if you have tired of our engaging nature center and pristine beaches where you can enjoy beachcombing all by yourself. Check out the many different restaurants and cuisines while you're visiting Charleston.